Chai is a spiced tea popular in India and other parts of the world. Chai tea is made with black tea, or sometimes green tea, and a mixture of herbs and spices. 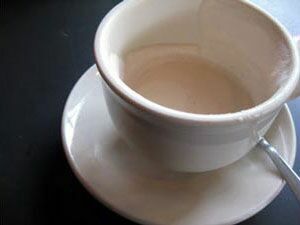 Chai is served with milk and sweetened with sugar or honey. Traditionally Masala chai is made with black tea (Assam) and Kashmiri chai with green tea. Given a choice I order hemp or soy chai more than I do coffee (significant given that I live in Seattle). I like my chai strong and spicy. After trying different packaged chais, I started making my own. There are lots of different chai recipes available and I’d like to share mine with you. Gently boil the above ingredients in 4 cups water for 15 minutes. Add 4 bags black or green tea, steep for 5 minutes more. Strain and then sweeten it with honey or sugar, add milk, soy milk or better yet hemp milk to taste.